What? I Have to PAY to Borrow Gold? The GOLD & SILVER markets can look odd places to outsiders, writes Adrian Ash at BullionVault. This year's price drop has been so aggressive, it's only making them odder. Take the market for borrowing gold, for instance. Few people understand the difference between leasing and forward swaps. Nor should they care, not as a rule. Even if you really haven't got anything better to worry about, the two forms of gold borrowing look very similar at first glance. Lending gold for a rate of interest amounts pretty much, overall, to swapping it for the current cash value, and agreeing a date in the future to swap back. More urgently, the returns to large gold owners offered by either leasing or swapping large quantities of bullion have both jumped sharply this month. But these two markets are not identical. As our man in New York, Miguel Perez-Santalla, explained last month, in gold leasing there is a lender and a borrower of metal. And as you'd expect, the borrower pays the lender a rate of interest. It's always positive to the lender, because it's an unsecured loan. So the rate of interest depends on the borrower's credit-worthiness. Simple. 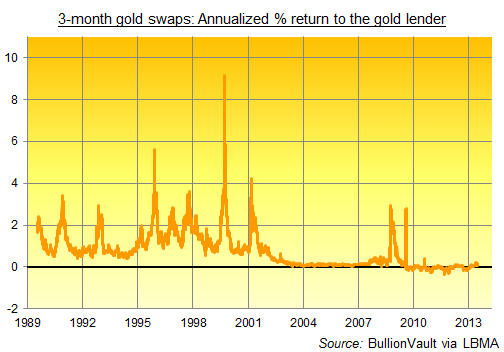 Gold swaps, on the other hand, are where the gold lender pays the borrower a rate of interest. Seriously. But again it is simple. Kinda. Because storing physical bullion safely isn't cost-free (even if it is very cheap). Gold owners also miss out on the interest rate which holding cash instead would provide. So if someone wants to swap your gold for its cash value today, and swap back sometime in the future, they will then bear those two costs – storage fees and lost interest – in the meantime. So they might reasonably expect you to pay them to take it away. And that's what the big bullion banks usually do. You can see the Gold Forward Offered Rate on the website of the London Bullion Market Association, which collates data from its biggest members. Look down to this week's figures, however, and you'll see it has gone negative on gold swaps lasting as long as 6 months. The gold owner, in other words, now wants to receive a rate of interest – rather than paying it – as well as getting the full cash value, which will be swapped back at the end of the term. In the meantime, the owner will have earned interest on that cash (see the LBMA's middle columns, which are only updated a week late), plus the newly positive rate of interest on the gold itself (the first set of columns, where rates are now, umm, negative because they're positive) to get a rising return as shown in the third set of columns (again updated a week late). Confused? You're not alone. Bloggers across the web get this stuff wrong all the time. But the reason this new switch has happened, with offered rates going negative (ie, positive for the gold lender in a swap) is two-fold. First, gold demand out of Asia has risen dramatically as the price has sunk. Canny consumers who shied away at $1500 and $1600 per ounce are now emptying coin and trinket shops in Hong Kong and mainland China, paying $40 per ounce or more above the world's London benchmark price of $1250 or so. These retail units typically start life as large, wholesale Good Delivery bars, and so need smelting, re-refining and recasting into smaller kilobars (investors in China prefer 0.9999 purity to the standard 0.995). That all adds friction to the logistics chain. Manufacturers are anxious not to miss this pop in demand thanks to delayed delivery, so some are borrowing gold as well as buying it. Second, hedge funds and other speculators got busy "shorting" gold to profit from its price drop. The primary route has been the US gold futures market, where the number of bearish bets held by non-industry players has surged to record levels week after week since March. Demand for borrowing gold in swaps and leases has surged too in the physical wholesale market. Because big traders want to borrow gold, sell it now, invest the cash elsewhere, and then repay it with much cheaper gold in future. The same happens in every other financial market. But shorting gold is now so popular, that large gold owners willing to help suddenly have the whip hand, or something like it. Which is a rare event. Negative gold offered rates were last seen during the Lehman's crisis, when all markets froze, and just before gold found its floor and turned very much higher, very much faster than anything else. Before that, you have to go back to 1999, pretty much when the bull market began. As the 20th century gasped its last, the gold mining industry was heavily short gold, having sold a big chunk of its future production for fear of ever-falling prices. Central banks in Europe took the role of lender, trying to earn a yield from their "legacy gold" stockpiles, built up during the long death of the Gold Standard monetary system of a century before. The initial trade only pushed gold lower again, as the miners sold the metal they borrowed. Unwinding the miners' leases and forward sales as prices then rose only drove prices up faster again. Back to 2013, and who are today's gold lenders? Large investment houses stepped in at the peak of the financial crisis, ready to lend their big gold holdings as stockpiles swelled and prices soared. Back in 2011, however, few people wanted to take the other side of the trade. Borrowing gold when the price was hitting new all-time highs looked a mug's game, leaving those would-be lenders with no one to lend to. Now that prices are down, gold borrowing is de rigueur again. But many of those would-be lenders have quit their positions. Gross bullion sales from Western investment hoards perhaps totalled 1,000 tonnes in the last four months alone. That leaves the leasing and swaps markets with fewer would-be sources of metal. Which gives those institutions able to answer the borrowers' call a better chance at turning a profit, or something like it. The current pop in gold lease and offered forward rates is likely playing a big role in nudging the gold price higher right now. Because there's something of a scramble to borrow gold. Yes, it's small right now judging from the uptick in returns to large lenders of gold. But the fact this uptick comes as cash interest rates are also rising points to the size of this year's short-selling by large speculators, plus the demand for physical metal from Asia. Annualized rates on 3-month swaps now offer 0.34% to the gold lender. Three-month lease rates are up at 2.5% annualized according to Mitsui data today. What if the mining industry joins the quiet cue for borrowing metal? This year's crash looks a lot like the late 1990s' horror-show, after all. Perhaps one-third of world output is now at break-even or worse according to new London consultancy Metals Focus. So a return to gold miner hedging is a clear risk for the market. But with Western investment holdings well down from their peak, and central banks now buying net-net – thanks to Europe sitting pat, and the emerging giants slowly increasing their hoards – who's going to play lender?